Peter Salerno Inc. Supports Summer Events at Miele Center in Princeton, NJ – Design Your Lifestyle. It’s been several weeks since Peter Salerno visited the Miele Center in Princeton, New Jersey (one of 11 Miele centers in the United States), and the impression is still fresh in his mind. 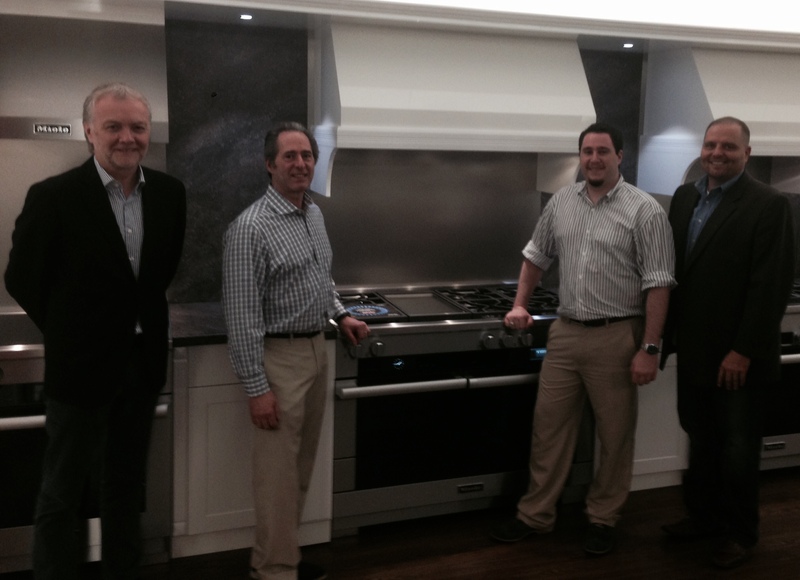 Exclusive photo from Peter Salerno’s visit to Miele USA’s Princeton showroom. Miele USA’s inspirational resource centers are staffed with knowledgeable, friendly associates ready to provide you with in-depth product demonstrations, unforgettable events and a wealth of ideas for your home and lifestyle. Their list of events are open to the public, and range from informational to enjoyable, from technical workshops to lifestyle events. Whether you want a master class in using Miele’s new Generation 6000 line of appliances (which are soon to appear in Peter Salerno Inc.’s award-winning design showroom in Wyckoff, NJ), cooking presentations, or an affordable-yet-exquisite wine tasting, Miele Princeton Center has you covered! June 6, 2015: MasterChef Class, 10:30 a.m. Discover how to get the most out of your Miele appliances. We will prepare items in our innovative Generation 6000 ovens and demonstrate our full line of cooking appliances. June 12: Full Steam Ahead, 10:30 a.m.
Come and join us for an intermediate hands-on class featuring the Combi-Steam and Steam ovens. The class will cover operation, the principles of steam and the utilization of multi-stage programs. June 15: Riedel Veritas Wine Glass Tasting Seminar, 6:00 p.m.
June 18: MasterChef Class, 5:30 p.m.
July 8: Full Steam Ahead, 5:30 p.m.
July 18: MasterChef Class, 10:30 a.m.
July 22: Intro to Steam, 5:30 p.m. Learn the basics of how Miele Combi-Steam and Steam ovens work. We will demonstrate the versatility and ease of steam cooking. We’ll take you through the features and benefits to establish which oven is the one for you. July 30: MasterChef Class, 5:30 p.m.
August 8: Full Steam Ahead, 10:30 a.m.
August 13: Product Cooking Demonstration, 5:30 p.m. Experience Miele’s new generation of cooking appliances and savor a wide variety of freshly prepared cuisine during a relaxed and informative presentation. August 21: MasterChef Class, 10:30 a.m.
August 26: MasterChef Class, 5:30 p.m.
For more information about Peter Salerno Inc. and Miele’s outstanding new line of appliances, please contact Peter Salerno Inc. at (201) 251-6608 or fill out the contact form below.